If you have been paying attention to media Twitter last week, you will have noticed the discussion and part-outrage when the Correspondent announced that it won't open a separate newsroom in the US after all. But I think we are missing something important from this debate. We want the Correspondent to change the way news is made, so why should they have a traditional newsroom? Well, let me give you my view on this as a media analyst. There are some things I like, and some problems I think they will face. Before we start, let me very quickly summarize what happened for those of you who don't already know. 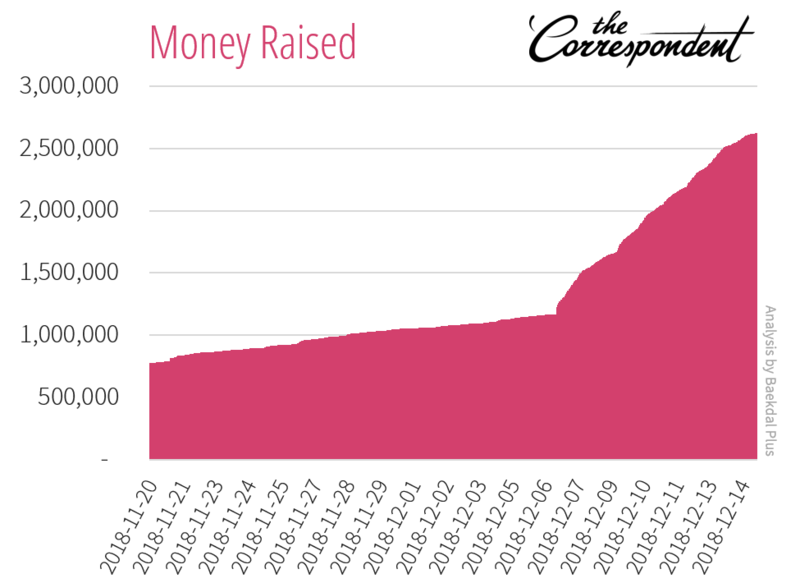 November/December 2018: Last year, the Correspondent launched a crowdfunding campaign to set up an English-language version of the Correspondent, following their already successful newspaper in the Netherlands (in Dutch). The campaign was run from New York, and almost everything about it was based on US activities (at least that was what it looked like from the outside). As a result, many thought of this as the 'US-launch of the Correspondent'. And there were many indicators pointing in this direction. There was a job ad hiring someone to work in New York; when you became a founding member, they offered to have your name written on their wall ... in New York. So clearly they had plans, or at least ambitions for a US office. December 2018: The crowdfunding campaign ended on December 14, 2018 ... and they barely made it. 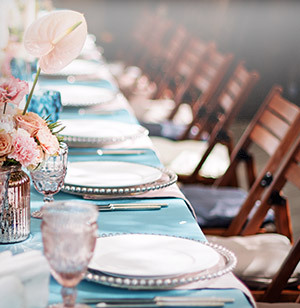 Their goal was to raise $2.5 million, and they reached $2.7 million. And when you look at how it actually happened, you'll immediately notice that there was a big change ⅔ into the campaign, which was the result of them being featured on The Daily Show. 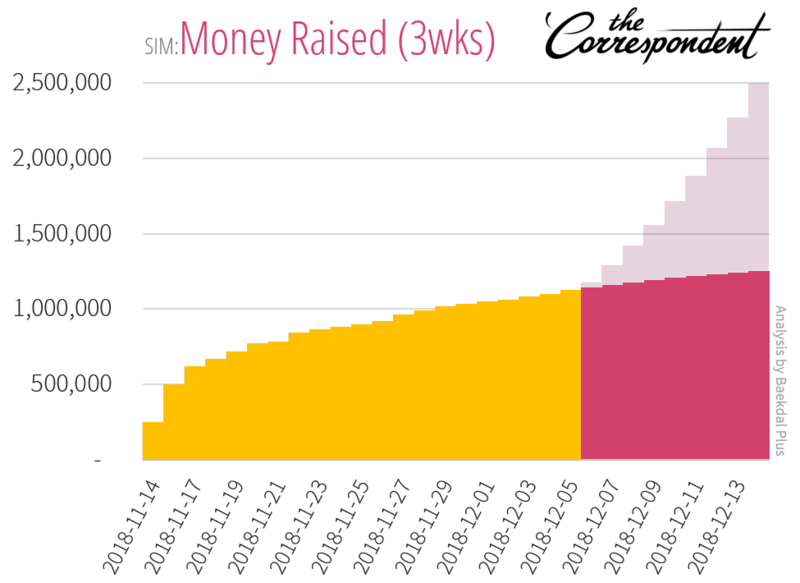 I wrote much more about what actually happened in "A look at the Correspondent's Crowdfunding Campaign", where I break down the numbers. This certainly sounds impressive, and when I asked Ernst Pfauth about this, he told me that 46% of all members are from the US. 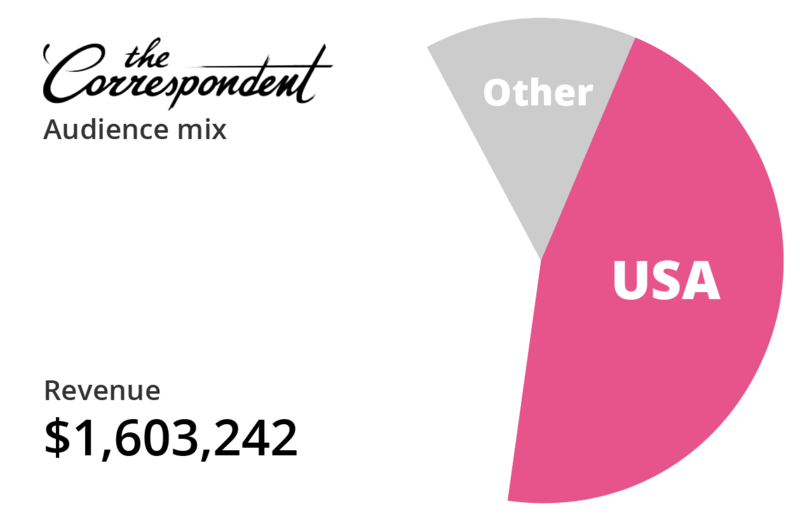 And this shows that The Correspondent will have to focus on more than just the US market. Mind you, in the months leading up to the campaign, most of the (US) press saw this as a US launch, with headlines like: "The Correspondent to launch in the US", but when I asked him about this, he said that the focus wasn't really to be a US-focused site, but to instead expand to the English language. It was always our intention to launch a global platform. 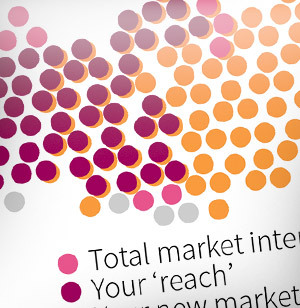 We're expanding to the English-language, not only the US. [...] We chose New York as the location for our campaign office because the US is the biggest English market. This makes a lot of sense, and especially with these numbers. 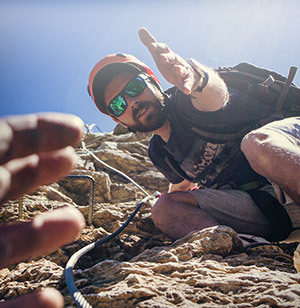 March 25, 2019: Ernst Pfauth posted an update to Correspondent's members, explaining what decision they had made. It had three points. First, they announced that they were hiring a membership director, who would be the person responsible for nurturing their members. And this person would be physically located at their Amsterdam HQ. Secondly, we were told that there would be no US office, and the whole thing would instead be run from Amsterdam. [...] those at the heart of The Correspondent's journalism - the correspondents themselves-will be based all over the world, some in the US no doubt, but not by default. And with this, media Twitter went crazy. Some said they had been lied to; others were simply disappointed; but worst of all, many started arguing that the Correspondent needed a US office like every other newspaper. Okay, here is my analysis of this. We are going to talk about four things. 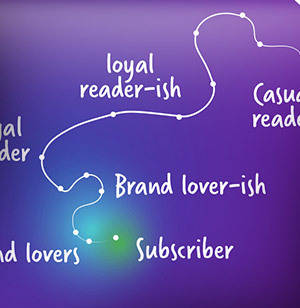 First, the failed communication; secondly, the financial side of it; then about the focus of the Correspondent; and finally, the main problems that I see for them in the future. Obviously we all agree that the Correspondent failed in their communication to their members. 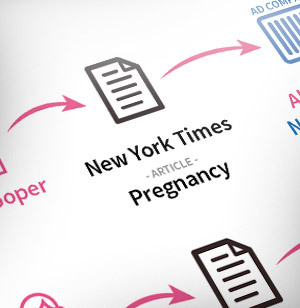 While I might argue that the Correspondent is still way more transparent than any other publisher, this change clearly needed a more in-depth explanation. While Ernst Pfauth explained what they would do going forward, he didn't explain why. And since then both Founding Editor Rob Wijnberg, and their main ambassador Jay Rosen have provided further explanations and apologies. See: "Yep. The Correspondent screwed up in its communications with members. Here's how." Personally, I didn't think much about this. Partly because I'm not located in the US, and secondly, because I already knew that this would have a mainly global focus from my discussions with Ernst back in December. So, I never really considered a physical US office as a requirement for funding. But I can see why some would be upset about this. However, as a media analyst, my focus is mainly on the editorial and the financial side of things. So let's talk about the finances. As I explained above, the Correspondent barely managed to get funded, and before appearing on The Daily Show, their growth rate was so slow that they would probably have ended up way short of their goal. In fact, this was what their funding levels looked like before that, and as you can see, they have a very slow organic growth rate (about 0.8% growth). So, if you were to ask me to predict what the growth rates will be going forward, I would be extremely cautious about my answer. 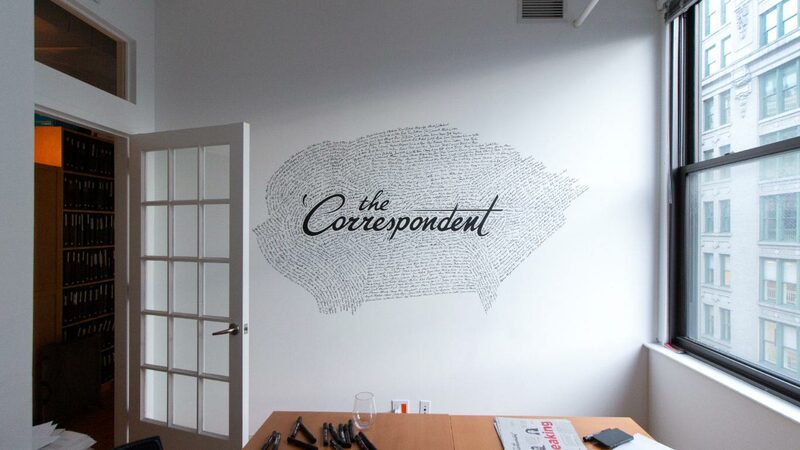 I hope that the Correspondent will be a massive success in the future, but I expect it to be a very slow process. But this is not the biggest problem with their finances. A much bigger problem is the audience mix itself. As I mentioned earlier, Ernst Pfauth told me back in December that only 46% of their new members were from the US, but then last week we also learned that 40% were Dutch, with the remaining percentage coming from other countries. The problem here are all the people from the Netherlands. These are most likely existing subscribers for the Dutch version of the Correspondent who wanted to help them launch the English version. These people already have a better place to be (the Dutch version), so next year when the Correspondent will ask people to renew their membership, this Dutch audience is very unlikely to renew. They will just spend their money on the Dutch version instead, which is far more relevant to them. 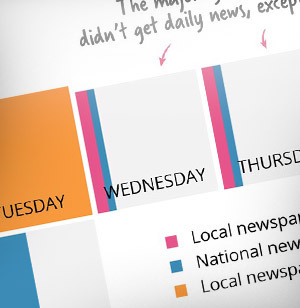 So, the 'global' version of the Correspondent actually looks like this. This is the revenue that they have to work with moving forward, and the baseline from which to grow. What this essentially means is that their crowdfunding campaign failed. Their goal was to raise $2.5 million to start a global English language version. They did raise that money (ended at $2.7m), but $1.2 million came from just one country (USA), with $400,000 coming from other countries (and $1.1 million from The Netherlands). So think about it. If you only have $1.2 million, would it make sense to create a dedicated US version of the Correspondent, like many thought they would do? And then also set up an office in the most expensive city in the US? In theory, they could do this, but it would put so many constraints on their future growth that it would be a nightmare. So, I agree with the Correspondent that not setting up a separate office and newsroom in the US would be the smarter choice. This gives them far more money to work with, which they can spend on journalism and audience development instead. It's not the best outcome, but it's the smarter choice. However, there are other worries as well. Specifically, I'm worried about their 'global' focus. A local community in a global space? First of all, I love that the Correspondent is expanding to the English language, because we need more publishers like them. However, global is a big place. 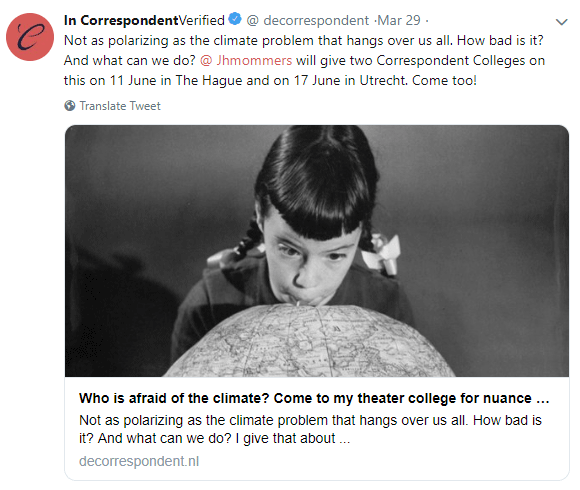 I don't know this for sure, but I suspect that one of the big reasons why the Correspondent has become successful in the Netherlands is because of how close it is to its community. This is often a problem we see with other newspapers. When they do a study asking people if the news they bring is relevant for "people like me", the results from other newspapers are often abysmal. What I like about the Correspondent is that they seem to have changed this. I don't have any specific study or metric, but the sense that I get from people talking about them is that their articles are just far more in tune with what their readers are interested in learning about. This is great journalism. It's focused, it's in-depth, it has a very 'young' feel to it in terms of what they are talking about, it has a future mindset, and there is no drama or outrage. 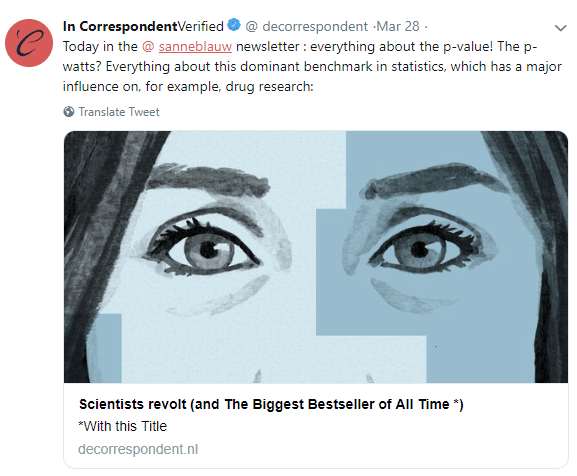 But it's also very Dutch, and for someone like me living in another country, most of these articles wouldn't be relevant to read ... well, except the last one by Sanne Blauw, which sounds very interesting to me. (In fact, I just noticed she has done a Tedx talk about it). This is a problem, because how are the Correspondent going to create an English-language global version with the same community feel? Every single time they write about something specific, it wouldn't be relevant to most people. 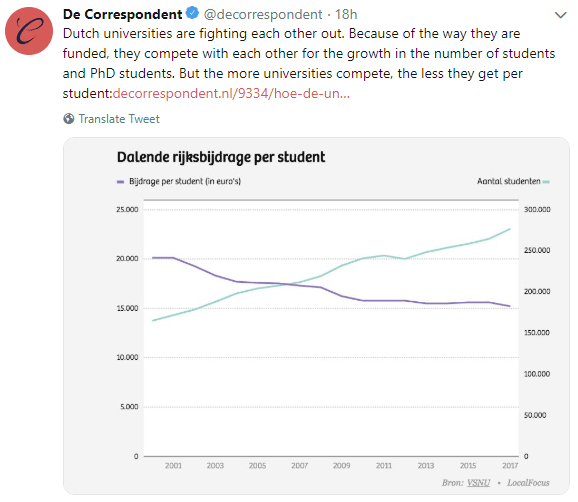 For instance, people in the US would be very interested in learning about the problems with US universities, but they wouldn't really care about the Dutch Universities. Climate change, of course, is a very global topic, but the progress and discussion around this vary greatly between countries. So how can you write one article that would be globally relevant? I'm not saying that it can't be done, but it's much harder to do. Then again, we have the financial problems, specifically around growth and churn. We come back to this chart. 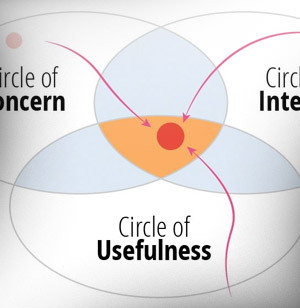 Think about who a global version of the Correspondent would appeal to. Well, as I explained earlier, the Dutch audience will just read the Dutch version instead, because it's already way better and far more personally relevant to them. But we also have a problem with people in the US. Historically, it has been nearly impossible for any newspaper to get people in the US to read about global news ... except when it relates to the US itself. I don't mean to disrespect, but the US is extremely self-centered. We can see this every time something newsworthy happens outside the US. I'm not talking about plane crashes or other 'outrage' news. I'm talking about news at the level of the Correspondent. 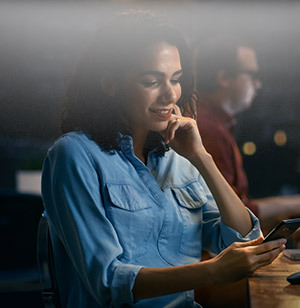 Most of the time, this type of news is never covered, and definitely not featured on the front pages, and even when it is, the traffic is extremely low. Compare this to Europe where we are used to reading about international news because many European countries are so small. The US market just isn't very globally focused. 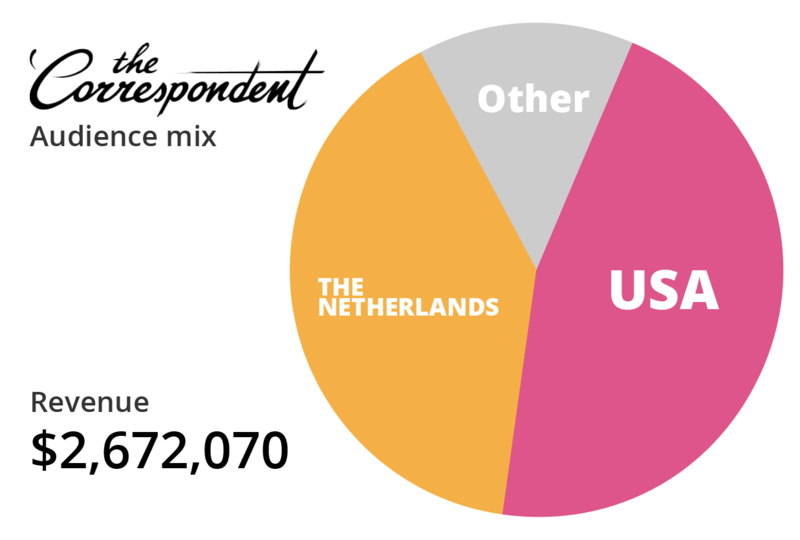 So, when you look at the graph above, the Dutch audience will turn to the Dutch version, and the US audience won't really care unless the article is about the US ... which leaves us with only the 14% who are their true global audience. So, the Correspondent has a huge challenge before them. Not just financially, but also with their scope and editorial focus. This is nowhere near a 'sure thing'. 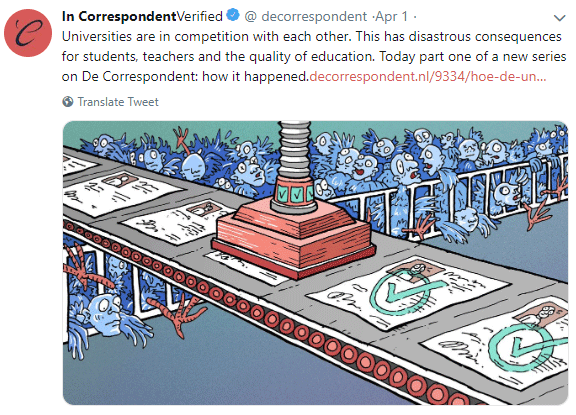 While I'm not sure that the English version of the Correspondent will ever work, I do think that we need to give them a chance, including not trying to make them do 'what other publishers do'. When I look at the Correspondent, I see something that I really like. I see much better and far more valuable journalism. I see an editorial style that has a much sharper understanding of relevancy. I see a newspaper that isn't publishing 20 articles about an airplane crash or 100s of stories about what Trump did in the past 24 hours. And I see an understanding for people's time, for their role as part of a community, and the need to think ahead. I'm not saying that they are perfect, but they are doing many things that I like. And when I see media people tweet that the Correspondent cannot possibly cover news without an office in New York, what I see is the old world of media. 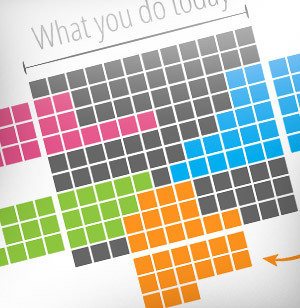 I see the traditional news setup with traditional newsrooms and organizational structures. I don't think this would be a good solution, I mean, what's next? Should they also have a 'White House correspondent' in order to cover politics? 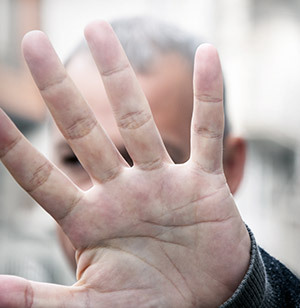 Should they have local journalists in each city before they can cover local issues? No, because that's the old way of thinking about journalism, and as we all know, the old way doesn't really work that well. We need some fresh thinking, both in terms of how to define what is news, how to report the news, how to organize a newspaper, and how we define society and communities as a whole. I have my doubts about the Correspondent. 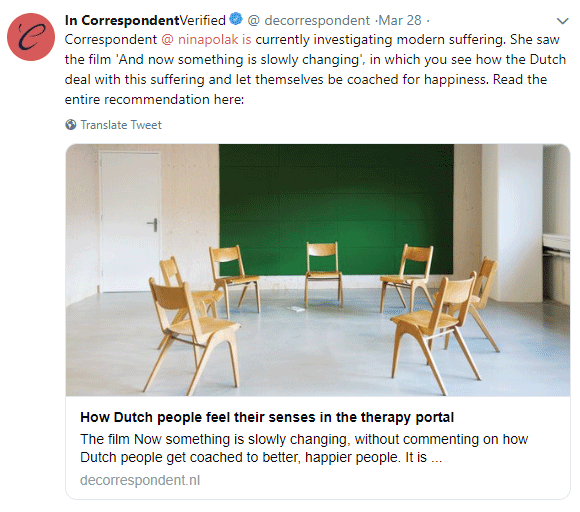 I worry about the financial baseline, their audience mix, and whether they can take what is essentially a very local-feeling version of a Dutch news site and turn that into something that is global. But I want them to try. And I want them to try to do something that other newspapers think is impossible.